Django Reinhardt and QHCF came to Norway on the 8th of February 1939 and held 2 concerts in the Gamle Logen in Oslo. The prestigious venue was full to bursting, and the audience spellbound. Gamle Logen was originally built as a Masonic Lodge and a banquet and concert hall in 1836.The idea and initiative came from Count Wedel Jarlsberg. The inauguration took place in 1839, and was celebrated with a ball attended by guests of honour King Carl Johan and Crown Prince Oscar. This laid the foundation for many festive events and traditions for which Gamle Logen later became renowned. 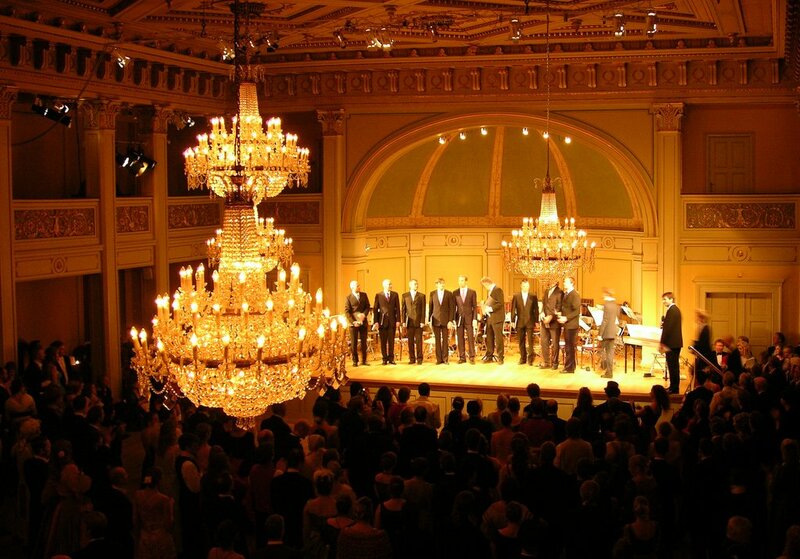 Gamle Logen´s main hall, decorated in late-Empire style and world famous for the quality of its acoustics, was officially opened in 1844 with a concert given by the famous Norwegian violinist Ole Bull. Even the notorious music critic, the composer Pauline Hall (feared for her unmerciful reviews), praised the orchestra for their cultivated musical style. She called Django an artist, but she is also said to have been more than a little disparaging over Stéphane Grappelli’s violin playing, which she compared to a cat’s meowing! studied the art of composition from 1909-14 in Oslo and abroad; a sojourn in Paris from 1912-13 gave her a lifelong interest in French music. She made many valuable contributions to the musical life of Norway, notably as a pioneer of modern music, which she championed in her capacity as music critic of the Oslo daily newspaper Dagbladet and as chairwoman of the society Ny Musikk (the Norwegian section of the ISCM) from 1938-1961. She was president of ISCM International from 1952-53. The entire ‘String Swing‘ band sat on the front row during the Concert. 21-year old Robert Normann was convinced that Django sat and stared at him as he played. In the interval Finn Westbye took the rest of the band with him backstage, and introduced them to the friends he had made in Paris 5 years earlier. Robert recalled many years later “it got better afterwards – in the 2nd set I could hear what he played!” Backstage after the concert it was Django that got the surprise: Robert was passed the legendary Selmer Maccaferri guitar, and played some improvised solos. After listening for a while, Django smiled broadly and is reputed to have said: “What do you want me for? You’ve got Robert Normann!” But as Robert said: “None of us knew any French….”.The following month Freddie Valier’s String Swing held a new studio session, following which the conductor quit, reportedly to devote himself to singing. He was probably the only one in the group guided by the impulses from the French Jazz Manouche. After this Robert kept the band’s name as String Swing, but later when there was a move away from using non-Norwegian titles, they became Robert Normanns Strengekvartett. War had now broken out in other parts of the world, and in another part of the globe a guitarist by the name of Charlie Christian was writing his name in the annals of jazz history. One might ask where the elegant improvisational style Normann developed at this time came from, it had no apparent connections to Django, preceded Charlie Christian, and was a far more modern interpretation than the style of Eddie Lang. The jazz historian Johs Bergh suggests that Robert “in the world he lived in” developed a unique style, in the same manner as Charlie Christian did in the USA, and Oscar Alemán in Argentina, essentially by listening primarily to prominent performers on other instruments. It seems that the saxophonists Leon “Chu” Berry and Coleman Hawkins were for Robert Normann what Lester Young was for Charlie Christian. Personnel: Arild Iversen, vln. Robert Normann, gtr. Finn Westbye, gtr. Fred Lange-Nielsen, bs. Lasse Herlofson, vib. 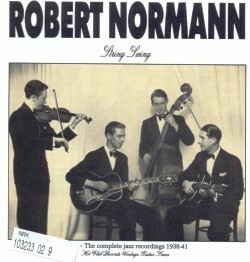 The complete jazz recordings of Robert Normann 1938-1941. Robert Uno Normann is called the best kept secret in Norwegian jazz. 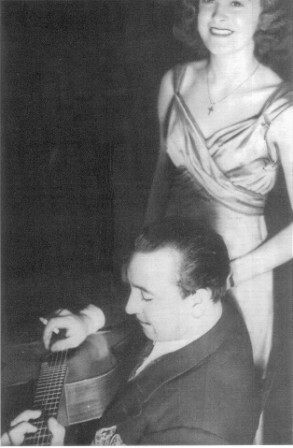 He developed a unique way of playing guitar, parallel with Django (they met in 1939) and Oscar Alemán. Here, in the beginning, still reminiscent of QHCF. The legendary guitarist Robert Normann is a giant in Norwegian jazz. The internationally renowned player is acknowledged as one of the instrument’s true original pioneers. Even Django Reinhardt was known to admire this master of swing on 6 strings, he once said: “Why do you want me to come to Norway? You’ve got Robert Normann!” The quiet and modest self-taught guitar icon was a master of swing, phrasing, note choices, accompaniment and soloing. One of the 1st to experiment with guitar improvisation, Normann is credited as being one of the founders of Norwegian Jazz. This 3rd and final compilation in the ‘definitive Normann collection’ series covers the height of his career from the early 50’s to the early 70’s. The multi-faceted life of the 6-string genius is covered by the excellent liner notes and the selection of tracks represents a worthy portrait of Normann. Frank Ottersen (b. March 14-1921. d. Mai 22-1971) was a Norwegian violinist, bass and tenor sax player. He became professional in 1938 and formed his own groups at the beginning of the 1940s. He played with a lot of the best Norwegian jazz musicians at that time, such as Alf Søgaard, Robert Normann, Rolf Syversen etc. Per Nielsen, clt/alt. Frank Ottersen, vln. Lulle Kristoffersen, pno. Robert Normann, gtr. Frank Aasen, gtr. Mikal Kolstad, bs. John Veiglum, dms. Every year since 1980, Django Reinhardt has been celebrated with his own festival in Norway. Now more than 50 other countries have copied this tradition.